(Palau, Micronesia – April 4, 2013) — Palau’s President Tommy Remengesau has proposed banning all commercial fishing in the Pacific nation’s waters to create one of the world’s largest marine reserves, covering an area roughly the size of France. President Remengesau, who was elected last November, says a commercial fishing ban could help Palau earn more money from tourism than it currently gets from tuna fleets. He says his vision is for an area “so well protected” that Palau would become the world’s largest marine sanctuary. “No longer will Palau be merely a shark sanctuary, it will be a sea sanctuary that protects all marine wildlife within Palau’s exclusive economic zone (EEZ),” President Remengesau said. 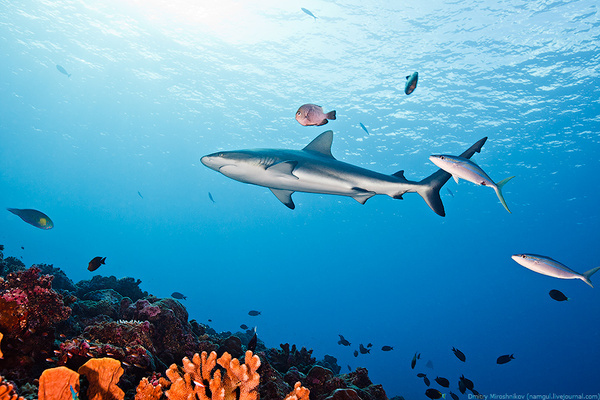 Palau won international acclaim when it created the world’s first shark sanctuary in 2009. Palau’s EEZ covers almost 630,000 square kilometers of the northern Pacific, including world-renowned scuba diving and snorkeling sites. “The president feels that Palau is short-changed,” Sengebau said. He commented that Palau licensed a total of 129 foreign fishing vessels in 2010 but Pacific island nations received only a fraction of the income generated by tuna captured in their waters. “Revenue received from commercial fishing licences and taxes from commercial fishing is a drop in the bucket compared to the profits made by large fishing companies,” he said. President Remengesau said the proposal is in its early stages and the government would look at alternative revenue sources before implementing it, particularly tourism. “Some of that revenue will be recovered simply through the increase in tourism that results from the incredible marine biodiversity that will be protected by our sea sanctuary,” he said. About Palau: Located in the westernmost corner of Micronesia, Palau is an archipelago of more than 586 islands with about 20,000 inhabitants and was the world’s first official Shark Sanctuary, setting the pace for many other destinations to follow suit. Consistently ranked as one of the world’s best dive destinations, Palau is the ultimate paradise for the adventurous traveler, boasting some of the most spectacular water features and beaches as well as the world famous, swim friendly Jellyfish Lake and Rock Islands, which was recently inscribed onto United Nations Educational, Scientific and Cultural Organization (UNESCO) World Heritage List. With 1,450 species of fish and 500 species of coral, some have called Palau the “8th Natural Wonder of the World”, while others have identified Palau as “One of the Seven Underwater Wonders of the World.” For more information about Palau, please visit www.visit-palau.com.